I just got back from a trip to Italy to visit my sister who lives over there as a tour guide. It was so much fun!! Check out my guide to eating vegan in Italy! 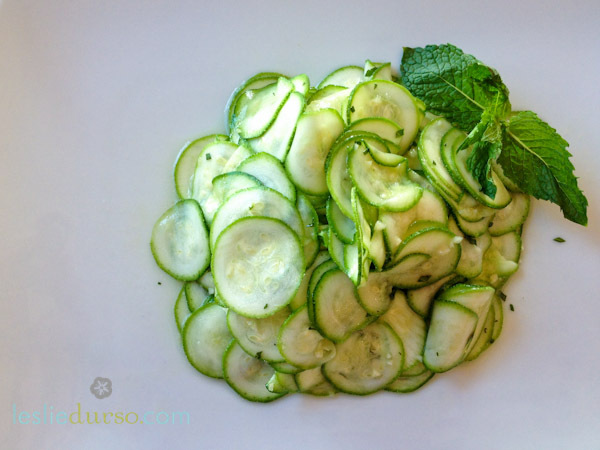 One of my faaaaavorite things I tasted in Italy was this zucchini carpaccio dish. We had it at a fabulous little restaurant in Locorotondo. When I recreated this dish, I tried to make it exactly how I tasted it there and I will say it came out pretty identical! This is a fabulous dish for a starter, an antipasti, or place it on a bed of arugula for a fantastic salad! Using a mandolin, slice the zucchini into paper thin rounds. Place in a bowl with all the other ingredients and stir well. Serves slightly chilled. Looks so simple and delicious! I’ve had something very similar to this growing up in Virginia even! That looks so delicious, Leslie! I love Italian foods! I tried to make this recipe, I knew a little different, and it really is very good.